In the summer of 2017, I began collaborating with musician Jimi Durso where together, we create improvised art and music. 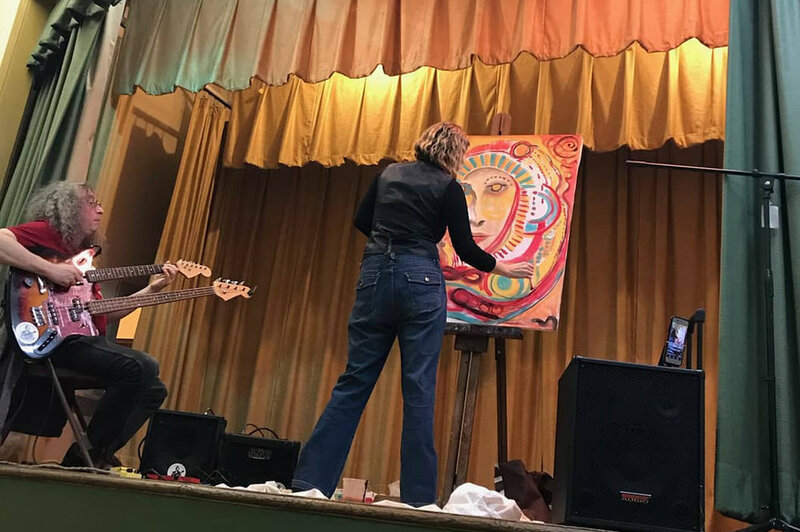 I've painted at live art/music events before and those are fun, but they are basically artists painting to the music rather than a reciprocal experience. The improv events with Jimi take it to a much deeper level, as they have become a form of communication. What I paint is inspired by what Jimi plays, and what he plays is inspired by what I paint. We create new works of art and music simultaneously, inspired in the moment by what each other is doing. He watches me and responds through his music, and I listen and respond through my art. It's a very special dialogue. Jimi and I also do improvised performances of dance and music. Some of these may be viewed on my Dance & Performance page. We are a creative team and have performed for audiences at venues throughout Long Island and the NY metropolitan area. For further information or to book us for an event, please contact either myself at: bellspirit@gmail.com or Jimi at: jimidurso@gmail.com. Photo of our performance "Cosmic "Shadow", with Jimi Durso (music) and Robyn Bellospirito (dance). Photo by Andrea M. Gordon.